developed, allowed the Hamamatsu company - which had started in 1887 as a maker of reed-organs - to dominate the market for medium-displacement sports twostrokes. 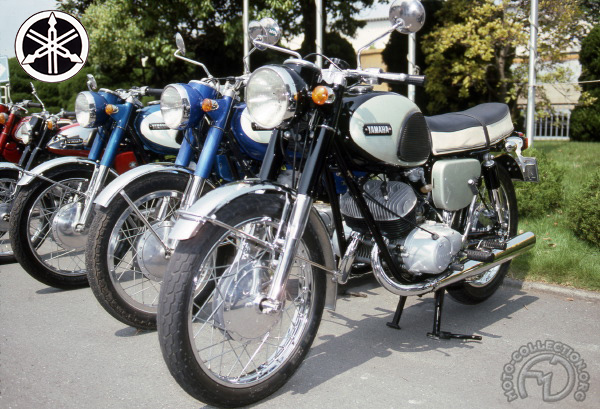 In 1964, Yamaha launched a new version of their successful 250, the DS 3, which came on the scene with two unique selling points: firstly, that very year Phil Read had won Yamaha's first 250cc world championship riding a twin-cylinder bike closely related to the production model, while the new Autolube lubrication system eliminated the tiresome need for two-stroke riders to mix oil with their gasoline. The Autolube was a mechanical pump whose output varied with the throttle opening. It was a fairly basic system that just ensured that the oil was injected in the light proportions without - as Suzuki would do later - ensuring that oil was fed under pressure to critical points. The engine of the DS 3, still with a horizontally divided crankcase like its distant ancestor the Adler, was a distinct improvement on the DS 2, launched in 1962, gaining a third crankshaft main bearing. On its introduction in 1964 it developed 24 hp @7500 rpm, and by the final version in 1967, power output had risen to 28 hp@ 8000 rpm. As for its performance, it was outstanding for its clay. The claimed maximum speed was 90 mph in 1964 and over 96 mph in 1967. Typical of its day, the dial in the headlamp shell incorporales speedometer and tachometer.